Students will focus on typesetting and printing techniques that move beyond straight lines and right angles to set type that curves, angles and bounces. We’ll begin by exploring historic methods and tools for handset typographic composition including circular and angle quads. Because these tools have become increasingly difficult to find, we’ll adapt materials from art supply and hardware stores for manipulating type and creating dynamic lock ups on both platen and cylinder presses. We will also experiment with Daredevil and Double Dog Daredevil Furniture, sets of lasercut furniture designed for type composition. Students will create a set of editioned prints to exchange. Some letterpress printing experience is helpful. Instructor: Jessica Spring learned to set real metal type in 1989 and has been a letterpress printer ever since, most recently inventing Daredevil Furniture to help other printers set type in circles, curves and angles. Her work at Springtide Press—artist books, broadsides and ephemera—is included in collections around the country and abroad. She also collaborates on the Dead Feminists broadside series with illustrator Chandler O’Leary. 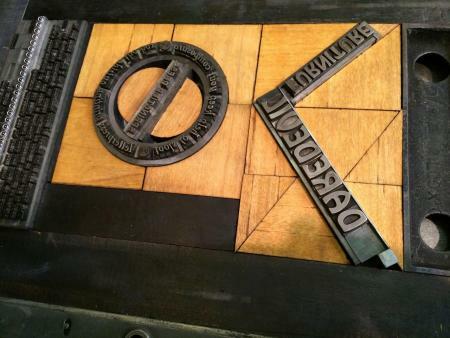 Spring has an MFA from Columbia College and teaches letterpress printing and book arts.